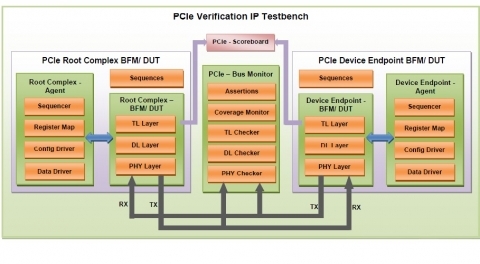 The PCI-e 3.0 Verification IP provides an effective & efficient way to verify the components interfacing with PCI-e 3.0 interface of an IP or SoC. The PCI-e 3.0 VIP is fully compliant with standard PCI Express® Base Specification Revision 3.0. This VIP is a light weight VIP with easy plug-andplay interface so that there is no hit on the design cycle time. Compliant with PCI Express Specifications 3.0 (8GT/s), 2.0 (5GT/s) and 1.1 (2.5GT/s). Supports Low Power management LTSSM states ‐ L0s, L1, L2, PCI‐ PM, ASPM.